BLS Reports Net Negative Inflation for 5 Months: Anyone Believe That? Today the BLS reported the CPI was flat. The Econoday consensus was for a 0.1% rise. Over the last five months, the CPI is -0.1%. Over the last four months, the CPI is -0.2%. In what is one of the very weakest 4-month stretch in 60 years of records, core consumer prices could manage only a 0.1 percent increase in June. This is the third straight 0.1 percent showing for the core (ex food & energy) that was preceded by the very rare 0.1 percent decline in March. Total prices were unchanged in the month with food neutral and energy down 1.6 percent. Housing, which is a central category, continues to moderate, also coming in at 0.1 percent following a 0.2 percent gain in May. Apparel is down for a fourth month in a row with transportation, reflecting falling vehicle prices, down for a second month. Medical care, which had been moderating, picked up with a 0.4 percent gain while prescription drugs which Janet Yellen has been citing for special weakness, bounced back with a 1.0 percent gain. However wireless telephone services, another area cited by Yellen for weakness, posted another sizable decline, down 0.8 percent in June. Year-on-year, the core is steady at 1.7 percent with total prices, which fluctuate much more than the core, down 3 tenths to 1.6 percent. The Fed may be blaming this stretch of weakness on special factors, but that argument is losing force. Supposedly medical care services are up only 0.3% over the last four months. Medical care commodities are up a net 0.3% over the last five months. Honestly, seems about right to me. I’m not subject to rent or healthcare inflation, but food seems to be steady and gas is definitely down. Clothing in general is ridiculously cheap as are electronics. If I didn’t already have everything I want, it would be a Golden Age. Lidl opened yesterday just down the street. The police had to direct traffic. That will make 5 grocery stores (plus Target) in a 2 mile stretch … in a semi rural area. Where I live they just approved a tax on income to fund better sidewalks, the government CPI most likely missed this. I would education to those 2. But I have no doubt housing will pay a visit to the woodshed … SOON. It will take a bit time for comps to feed into the system, but once they do it will begin a vicious (downward) cycle. Mark Hanson puts the lead car of the coaster on the down slope. I know this Jon Sellers guy is a libtard from California, but he managed to out-stupid himself with his above comment. Excluding all the big ticket items who’s costs are skyrocketing, the other prices don’t look so bad…. really. These people are allowed to vote and carry sharp objects too. yes, and of course without the “GOP” in collusion they couldn’t do what they do. I know there are people out there who believe alternate measures of inflation such as Williams Shadow Stats. Over a year or so, it’s very difficult for a casual observer to know who is right, but there are some very important things that become very noticeable over the longer term. Williams CPI seems to run about 3% higher than the official CPI. Note that one of the most important uses of the CPI is to index social security payments. Let’s suppose that Social Security payments go up at the CPI, but suppose also, for a minute, that Williams is right, and that the real inflation is 3% a year higher than the CPI. What are the ramifications? Well, that means that a person on Social Security is 3% worse off a year later. Is that possible? Sure. Now let’s further suppose that the same thing happens each year. The government modified the CPI formula about 20 years ago, under Bill Clinton. If the CPI has been off by 3% a year ever since, for the last 20 years, that would mean that the purchasing power for Seniors on Social Security today would be down to .97^20, or to 54% of where it was twenty years ago. Have Seniors really lost half their purchasing power? They weren’t all that well off twenty years ago. Are they all in abject poverty today? No, they seem to be about same as twenty years ago, some perhaps a bit better, others perhaps a bit worse. Therefore we can reasonably conclude that the CPI is close to correct, and that Williams is not close to correct. In fact, that’s why they modified the CPI formula. It was an observable phenomenon that during the 70s and 80s, the standard of living was rising every year for Seniors because the CPI was overstating the actual inflation. Raising their standard of living isn’t necessarily a bad thing, but if it is to be done, it should be done consciously, not buy overly generous cost of living increases. Social security is a pyramid scheme that will blow up in the socialist faces, just like all their hair brained ideas. There is no free lunch, and nothing FDR said or did could change that — Social Security was guaranteed to collapse within two generations no matter what anyone said or did. Everything is a pyramid scheme. The DOW fell 90% in the early 1930’s. Everything has a cycle and every cycle has a down phase. Every boom ends in a bust. A Ponzi scheme, a pyramid scheme. An interest rate chart from the 1930’s to now, looks like a pyramid. The rise and fall of the Roman Empire, was like a pyramid. You frequently suggest the American Social Security System is a pyramid scheme that will soon run out of money. You mention the same thing about many state and corporate pensions. That’s why I always suggest that America check out well run pension systems in other countries. Then you tell me I don’t know what I’m talking about. Yet this year, both my spouse and I will have to contribute less to our pensions because our pension plans are in a significant surplus situation. This is the second time in my career that my contribution rate has dropped, and for my spouse, it’s the third time. (please note that the rate drops are temporary, and often last for a few years, then rates go back to normal). Similarly, our government plans are very well run and secure, unlike in America. Pension plans can be well run. Apparently, not in America, based on what you say. 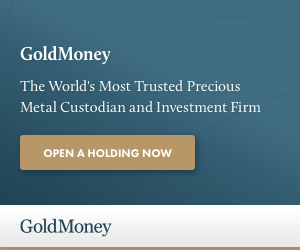 @Ron J — just because a price (or index) falls 90% doesn’t make it a ponzi scheme. A ponzi scheme depends on new buyers to fund payouts to earlier buyers — and often it depends on exponentially more new buyers to make the scheme work. That is a ponzi scheme. Social Security was structured from day one as a ponzi scheme. The first recipient (Ezra something?) paid into the system for 3 weeks, then drew benefits (paid for by younger workers) for more than 2 decades. Those younger workers contributions were not saved or invested, they were used to pay first participants like Ezra ???. When the younger workers got older, they were paid by contributions from baby boomers. Now that baby boomers think they can retire, they would need a MUCH MUCH bigger subsequent generation to make the scheme work… and the population simply can’t grow exponentially without creating problems. Public pensions are ponzi schemes, because the amount paid in does not cover the present value of future benefits. The difference is stolen from younger workers. This ponzi scheme works so long as each generation’s headcount is several multiples of the previous generation — but municipal headcount cannot grow faster than the underlying population and underlying local economy that supports it. I agree that Social Security is a Ponzi scheme, and that it will inevitably collapse. Right now I believe it is secure through about 2034. I expect that they will find a way to kick the can down the road a few more years, so I’m thinking that the collapse will come in the 2037-45 time frame, which is about the time the US will have trouble getting others to accept debt denominated in USD. That, however, has nothing to do with whether the CPI is right or wrong, which is a whole separate matter. He’s at the opposite end of the 10 freeway from CA…….. Where the guys whose retirement plans are destroyed by ZIRP live. Which is likely why price pressures seem more moderate there, than in most of the country. In CA, at least in the Bay Area and coastal SoCal, there hasn’t been “moderate” price pressures since at least the Dot Com bust. I agree. It seems about right to me. Oil prices are down about 20% in that time, and have filtered into a lot of the other products by now. That’s why, by the way, that long term the CPI without food and energy is about equal to CPI including food and energy – price changes in one area eventually shows up in the the others. I can’t comment on housing prices as I’ve own my home for years. As for the falling auto/truck prices, Mish has commented on it here, and that and energy are the two biggest price drops. A neighbor three doors down the street had a huge tree fall directly on his house, pretty much destroying it. The fire department and neighbors with chainsaws worked to cut away part of the tree in the rain because their dog was trapped in a room with no outside door. It is a mess. Everyone on the street is trying to help the family retrieve whatever they can as rain falls inside the house. Insurance will presumably help them repair the house and replace contents, but they have lots of photos and other “worthless to insurance” stuff that has priceless sentimental value. Helping a neighborhood family who have in the past helped everyone else in the community is important. Arguing over statistics that don’t make any sense at all, especially when I read stupid comments from California, is not important. They want everything for free, done for them, paid for by others — that isn’t progressive. Its selfish and lazy. When one is a screw-up and people take the time to tell you so, it means they care enough and want you to live up to your potential. When you screw up like the libtards have, at some point people will stop arguing with you. It doesn’t mean people agree with Russia-gate and turning doctors into slaves, it means people don’t think enough of you to bother arguing. It means people think the libtards just aren’t worth our time. And yet the unemployment rate is around 4.5%. Makes perfect sense. We run a online retail business and our packing and shipping costs have exploded in the past three years. Add in our healthcare insurance and liability coverage and making a living is harder every day. Margins are getting killed due to Amazon and a weak economy and the inflation that hits small business is never discussed. Govt issued numbers have been BS so that the Fed can keep rates down and the markets up. 50,00o mile cars in rental fleet, 27000 used to be average, it’s now moved to 37,,000 average topping at 50000 miles. Another thing is traffic during hours of 10 am to 2 pm is down greatly, which is good except you know it means people are home or out of town because mall traffic is limited. On the other hand this has to be the best Summer for roadbuilders and and infrastructure Utility’s. But New construction of single family homes and commercial property are almost invisible. 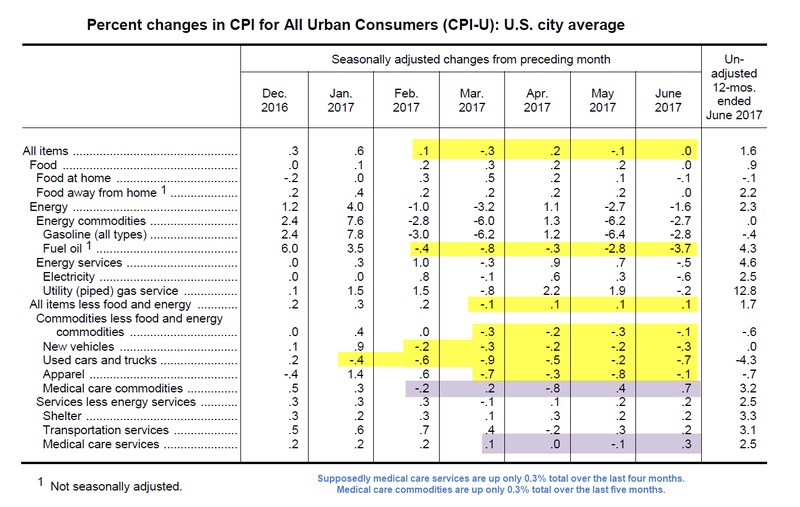 If you own your home (don’t pay rent), have already finished your education and don’t need medical care (and don’t pay for health insurance) I think the current CPI stats are semi-believable. But not many people fit into this category. Always amused me that people that don’t own housing think they are flat. The ones that loved making fun of homeowners when housing was crapping out. You’re either long it or short it. Welcome to the other side of that trade. Deflation would be wonderful, if it ever happens. The BLS doesn’t seem to pay much attention to how much seniors have to pay for a company to mow their lawns, or the astronomical price of medical insurance. Cars have become virtually unaffordable due to auto inflation, but the BLS pretends they are cheaper because of hedonics. The CPI is nonsensical. Wages, pension, and Social Security don’t go very far nowadays. Don’t even ask about city/state budgets because of health care and education inflation being to the moon. So long as you and your family do not to eat, sleep in sheltered space, drive anywhere, seek medical attention, study, insure anything, save a nest egg, bath and clothe yourself, support a charitable cause, care for a loved one or maintain a vehicle you should be okay. If you must participate in any such activities you will experience inflation. Otherwise, you might be good. Our choice is to wish for what should be, or face what is. That said, the dollar is a liability, not an asset. To maintain the present system, it must continue to be devalued. It’s just the way it is. I would have fired someone if they had handed me that report. First I would have thrown it at their head. Voters can change to a gold standard at any time in a democracy. Inflation may bail out the banks, but it moves the average person slowly backward. Results vary greatly from family to family with a great deal of it having to do with healthcare, however. those taking the CPI numbers that are currently being reported to heart are vulnerable to future economic risk. We should be aware the numbers government pumps out today are the result of changes made in the 1990s when political Washington moved to change the nature of the CPI. The aggregate impact of the reporting changes since 1980 has been to reduce the reported level of annual CPI inflation by roughly seven percentage points meaning there is no question as to the understatement of inflation. The effects are cumulative going forward so, over time the CPI has become less of a reflection of true inflation. More on this subject in the article below. Paid 69 cents a dozen for eggs the other day. Don’t think they were from Chinese chickens, but not sure. Hell, at these prices they are affordable enough to chuck at politicians. My cost for electricity rose 10% per kwh in the past year based on my bills. Being an involuntary foot soldier in the war on global warming is expensive. Fortunately, my property taxes continue to go up very slowly, thanks to the late Howard Jarvis and Paul Gann. In a culture of make believe,all is believable. I don’t live in the US so my take on prices will be somewhat different. First, since my taxes pay for health care, I don’t have to pay health insurance premiums. As a result, I don’t have to worry about how much my premiums might go up. Second, since I own my home, I don’t have to worry about rent increases. Looking at what’s left, in the last year I have seen decreases in the following areas: groceries, gasoline, electricity, income taxes, pension contributions. I have seen increases in clothing, and property taxes. Overall, I believe my monthly expenses have decreased slightly. I do not consider that this is a sign of deflation, as asset prices have increased significantly even as my monthly expenses have decreased. This week it was news that people need $100,000 annual income to afford housing in L.A. and that in San Francisco, those making up to $135,000 are eligible for some form of housing subsidy. It was also news recently, that the number of homeless in L.A. had risen some 23% over the last year. Get the illegals out and you will see rents and home prices fall.